Residents in Southern Oxfordshire are being reminded that their waste and recycling collections will change over the Christmas and New Year period. They can find out all the information they need on South Oxfordshire and Vale of White Horse district councils websites www.southoxon.gov.uk/christmaswaste and www.whitehorsedc.gov.uk/christmaswaste. Garden waste collections will be suspended over the Christmas period, while crews concentrate on collecting all the extra waste from Christmas. Garden waste customers will receive an extra collection in the spring to make up for this. Householders can also find out what to do with all their Christmas waste on the website, along with details of how to recycle their real Christmas trees. Details will also be available on the websites. South Oxfordshire and Vale of White Horse district councils have announced they intend to move to a new building on their former site at Crowmarsh Gifford. The two councils have been in temporary accommodation since the fire that destroyed their offices in an arson attack in January 2015. They moved into a vacant building on Milton Park six months after the fire, where they have been ever since. During that time the councils have investigated a wide range of options for their permanent home, and have now concluded that the most cost-effective solution is to move back to the site that is owned by South Oxfordshire District Council. The councils will now work to prepare the site to build a new, smaller headquarters, which is more suited to their needs. The building will include a new council chamber for South Oxfordshire’s committee meetings, while the Vale’s committees will continue to take place in The Beacon in Wantage. Residents in the Vale of White Horse are to get the chance to view plans for a new leisure centre for the Grove and Wantage area. To help meet the growing need for leisure facilities in the Grove and Wantage area, Vale of White Horse District Council is planning to build a new leisure centre at Mably Way. The aim is for the new centre to open in 2020. Members of the project team will be on hand at both events to answer any questions and people will have the opportunity to complete a survey to let the council know what they think. Cllr Charlotte Dickson, Cabinet Member for Leisure at Vale of White Horse District Council, said: “With many new homes due to be built in the Grove and Wantage area, and with the current centre already at full capacity, there is a growing need for new leisure facilities. Our aim is to meet this demand as soon as possible by investing in this new centre which we expect to open in 2020, well before many of the new homes have been built. Work to refurbish the much-loved outdoor pool in Abingdon’s Abbey Meadow is set to start later this month. The £1.3million project will see the small pool combined with the larger pool to create a beach-style walk in area, allowing easy access to the water for young children or those with disabilities, and a deep-water area for more experienced swimmers. A rubber crumbed surface will be installed to create a safe area around the pool and in front of the changing rooms. The changing rooms will also be refurbished. The equipment used to run the swimming pool will be replaced with new energy efficient system which will help to cut maintenance and operation costs. The work is expected to take around 28 weeks to complete with the pool due to open, weather permitting, in time for the 2018 summer season. It will be carried out by Vincent Stokes who specialise in building and refurbishing swimming pools and other leisure facilities and have worked with a number of high profile national leisure providers. The work to refurbish the outdoor pool will mark the culmination of a major project to improve Abbey Meadow to attract more visitors to the area. The new play park opened earlier this year to an overwhelmingly positive reception, while new public toilets, changing facilities and an accessible path will be installed over the coming months. Motorists using district council car parks in South Oxfordshire and the Vale of White Horse will soon benefit from the use of new pay and display machines. Following a successful trial, the new machines will be installed throughout August, starting in South Oxfordshire. They will allow you to pay by credit and debit card and also accept coins, including the new £1. Old £1 coins will continue to be accepted until they cease circulation on 15 October. Motorists will also still be able to pay by mobile phone via the Connect Cashless system. When using the new machines you will need to insert your vehicle registration on the key pad when paying to park. The new machines will be much cheaper and easier to maintain than the current stock which is a number of years old. The system will be powered by solar panels making it much cheaper and greener to run and, where possible, will be installed into the existing machine holders to save waste. South Oxfordshire and Vale of White Horse District Councils are urging anyone who is currently claiming a 25 per cent single person discount on their council tax to get in touch if they now have others living with them. The councils are carrying out checks to ensure that only those entitled to the discount are receiving it, and to help in their efforts to prevent and detect fraud and protect the public purse. The review will see the councils working with credit reference agencies to check people’s eligibility for the discount and ensure that all records are up to date. This may also involve writing out to taxpayers for further clarification. •	Vale of White Horse – [email protected] / 0345 302 2315. £6.5 million pounds has been invested in a brand new fleet of waste and recycling trucks, providing new and improved collections to households across southern Oxfordshire. The trucks – due to hit the roads in the autumn – will replace the old vehicles which are becoming unreliable as they reach the end of their life. The new vehicles, managed by South Oxfordshire and Vale of White Horse District Councils’ contractor Biffa, will carry out the waste, recycling and food recycling collection services for all 115,000 households across the districts. The councils and Biffa are working hard to resolve the problem, including drafting in extra vehicles and calling on the crews to work extra hours. In the event of non-collection of waste or recycling, residents are advised to leave their bins out and the crew will be back to collect them the next day. Cllr Charlotte Dickson, Vale of White Horse District Council Cabinet Member with responsibility for Waste, said: “We appreciate how important waste and recycling services are to local residents and we are very grateful for the efforts people make to recycle their waste. We hope they will be pleased that the new vehicles are on their way. Residents can stay informed about waste and recycling collections via the councils’ websites, including arranging bulky waste collections and reporting missed bins. •	Missed collections can be reported online via the South Oxfordshire District Council website or via the Vale of White Horse District Council website. •	The new vehicle fleet is being funded by Biffa. •	With the introduction of the new fleet, the Council is also advising residents of a change to the way their waste, recycling and rubbish is collected. At present, food waste and recycling are collected in separate compartments within the same truck. From the autumn, when the new fleet is introduced, these collections will be carried out by two separate vehicles – one for food waste, another for recycling or rubbish. •	The change is being made to improve the service and ensure collections are carried out as efficiently as possible. Over £1.6million in council tax arrears was recovered last year thanks to enforcement action taken by South Oxfordshire and Vale of White Horse District Councils. In 2016/17 the councils issued over 5,300 court summonses to people who had failed to pay their council tax. Magistrates then granted liability orders against 3,600 of those individuals – this meant enforcement action, including the use of bailiffs, could be taken to retrieve the money. Almost all of those in arrears then paid the money they owed, however the councils were forced to take further action against 96 people to ensure they paid their fair share towards the cost of providing public services. This resulted in 53 people receiving charging orders – which allows the councils to enforce the sale of a persons’ property to retrieve the money. One person who deliberately failed to pay was sent to prison, while seven were given suspended sentences. The councils also recovered and saved a further £167,000 after 62 people were caught claiming discounts on their council tax they weren’t entitled to. This resulted in nine being prosecuted in court and 47 fined. A man from Swindon has been fined £2,000 after admitting dumping rubbish, including a bath tub, toilet and sink, in Longcot. Ian Baker, 36, of Ramsbury Avenue, Swindon, appeared at Oxford Magistrates’ Court on Tuesday 2 May when he pleaded guilty to two charges of breaching the Environmental Protection Act after fly-tipping rubbish on Old Wharf Road on Saturday 15 October 2016. Magistrates’ heard how environment enforcement officers from Vale of White Horse District Council found evidence at the scene linking the rubbish back to an address in Swindon. The occupant confirmed the rubbish had been removed from her property by Ian Baker who was trading as Forebak Removals. Baker had agreed to remove the rubbish after accepting the booking via Facebook for £30. Despite being a registered waste carrier he chose to dump the rubbish rather than take it to an authorised waste and recycling centre. Magistrates fined Ian Baker £2,000 and ordered him to pay £632 costs and a victim surcharge of £150. Paul Holland, Environmental Protection Manager at Vale of White Horse District Council, said: “Fly-tipping can be a real blight on the landscape and shows a total disregard for the community in that area. 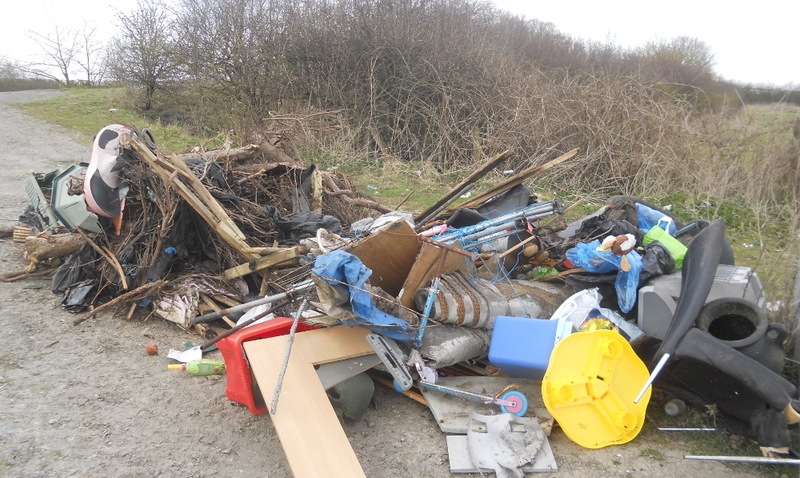 A man who accepted waste removal bookings on Facebook has been fined £500 after rubbish was found fly-tipped in Harwell. Adrian Tarft, 37, of Wash Common, Newbury, pleaded guilty at Oxford Magistrates’ Court on Tuesday 25 April to four charges in relation to breaching his duty of care under the Environmental Protection Act and one charge of transporting waste without being a registered waste carrier. Magistrates heard how, on 21 March 2016, Environmental Health Officers from Vale of White Horse District Council received a call from a local farmer who had found rubbish, including a television, tyres and carpet, fly-tipped at the entrance to a field he owned along the A417 London Road in Harwell. Officers were able to trace the waste to an address in Reading where a resident confirmed that she had made the booking with Tarft who was trading as Ebony Landscapes. The resident had made the booking via Facebook after seeing an advert Tarft had placed on the social media site. In an interview under caution Tarft admitted accepting the booking for £100 and removing the waste without being licensed to do so, but denied dumping the rubbish. He claimed that an associate had his van at the time the fly-tip took place but declined to identify the person allegedly responsible. In court Magistrates fined Tarft £500 and ordered him to pay the council’s £1,886 prosecution costs. Paul Holland, Environmental Protection Manager at Vale of White Horse District Council, said: “By law anyone being paid to transport waste must be registered to do so and have a record of what the rubbish is and where they’ve taken it.